Yesterday was crazy busy...so I didn't get a chance to blog about what I am thankful for on the last day of November, but here it is today. November 30: I am thankful for small acts of kindness. It is amazing how each day just one act of kindness can brighten your mood/day...whether that is your roommate making you a yummy cup of coffee, your sweet boyfriend driving you to work even though you only live 5 blocks away, or a coworker giving you a random gift....random acts of kindness are such small gifts that leave huge imprints, and I am very thankful for them! 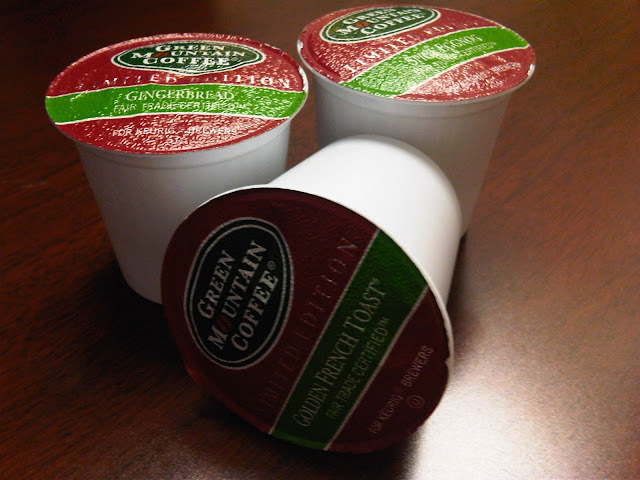 Some Holiday K-Cups my coworker brought to me this morning! I am really looking forward to my evening tonight. After a quick workout (I am currently on my "taper" for marathon training...and boy was I ready for it), I am going home to make a steaming bowl of this, and then I am going to watch the Victoria Secret Fashion. I taped it on Tuesday...my birthday...because eastern time screws up shows for me. The Fashion Show did not come on until 10PM EST....way too late for this chica! I am already in bed with my Ovaltine at that time of night. Workout motivation? Who am I kidding...I will be watching this while eating my last Georgetown Cupcake! I will let you know what I think of it tomorrow!